Today is a big day as it is our 30-year anniversary! Back in 1987, John Clemons, our Chairman and founder of the company, officially launched LearnKey. He had no idea the journey the company would take; he was just a young man who figured out there was a need in using video to train people how to use operating systems, software, technology, soft skills, professional development, and other topics that could help people improve their employability skills. 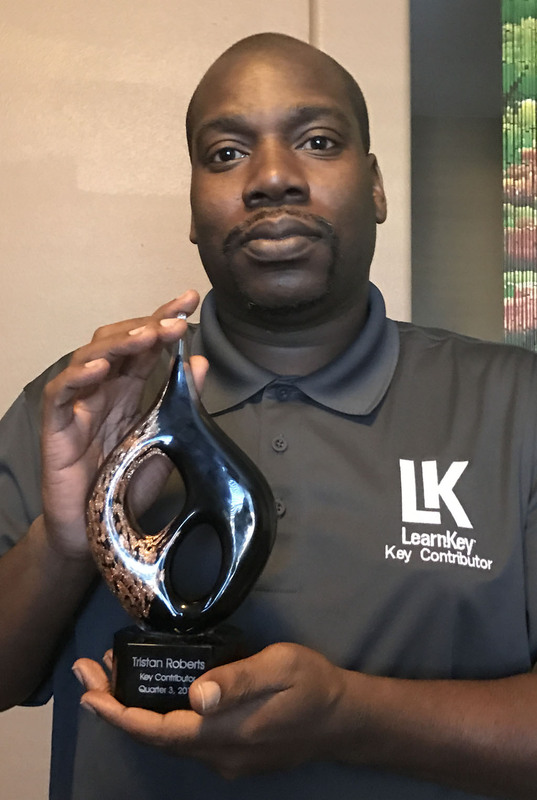 LearnKey would go on to help tens of thousands of people improve their job status or achieve first time IT careers through training. It started with offering courses on VHS, then CD-ROM (thanks to his brother David), then the Internet via OnlineExpert.com. Every step of the way this company figured out how to re-invent itself. At first it was a Business to Consumer (B-C) offering, then Business to Business (B-B), and each and every step of the way LearnKey figured it out. That is because the most successful piece of the business is the great people along the way who made LearnKey what it is today. There are hundreds of employees to thank for that, starting with some who have been with us for a very long time. Names like: Wendi Mangum, Scott Walker, Michael Watson, Chad Stocks, Jared Baker, Chip Ehlers, Wyett Ihler and Bart Giddings just to name a few are still with us today and for that we (John, David, Lori and I) are truly grateful. 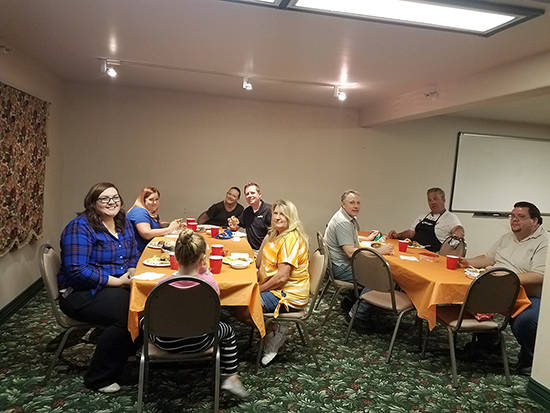 We started the celebration earlier this month by hosting some meals for the team; check out some of the pictures and you will see a few of the team members. Speaking of employees today, I embark on a trip through Utah to celebrate with those named above, and our other current employees. 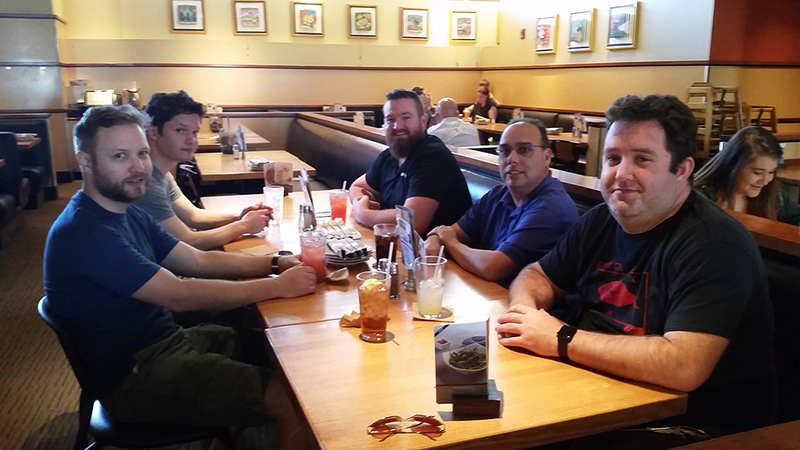 The trip will start in Salt Lake City visiting with our production team, then to Cedar City for some fun with our post production team, and will finally hit St. George by way of LearnKey’s corporate offices for a final celebration. Next week I will post pictures of the journey as we are proud to continue to do great work by Improving Employability Every Day. Congratulations LearnKey and the entire team, for it has been 30 years and I sense we will continue to celebrate in another 30 years!. Key Contributor Award Winner: All About Improving Employability Every Day! In January, Better Learning Systems announced our 2016 4th quarter Key Contributor Award winner, and not only was this person well deserving but she also is about our true “Why,” which is Improving Employability Every Day! 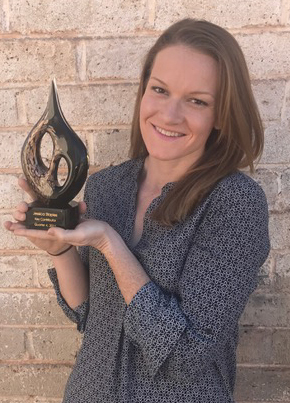 It gives me great pleasure to announce Ms. Jessica Staples as our most recent Key Contributor award winner, someone who is quite familiar with being awesome! She is in good company as previous winners include: Jason Manibog, Kim Johnson & Wyett Ihler, Sarah Blik & Melanie Benitez and of course the rockstar LearnKey Technical Support team! Jessica is a key member of our LearnKey Veteran Services team, making it through some major transitions over the past few years to help streamline and improve the program. She is also celebrating three (3) years with LearnKey this month. She is a true team player who constantly demonstrates our core values: Ease, Value, and Trust every day! During the 4th Quarter, Jessica was an enormous help with training and mentoring our newest VSR, Nina Sepulveda. With her extensive knowledge of the program and eagerness to help, she made the onboarding of Nina an easy process. We can’t thank her enough for her contribution as a team player. When things didn’t work perfectly or go according to plan, she made it work for her students and for LearnKey. She is extremely detailed and every one of her students has nothing but great things to say about her. When she takes on a task we can trust she will get it done, and with all of the I’s dotted and T’s crossed. In 2016 our LearnKey Veteran Services Team assisted students in achieving over 285 certifications, with Jessica directly supporting 128 of those certifications! Her dedication to helping our students achieve their goals is a true example of value. Again, please join me in congratulating Jessica for her spirited team work, “can do attitude,” and overwhelming positive and motivational support she provides our student base. She is a great reflection of what it means to be “Improving Employability Every Day”. During July, August and September these guys released a major software update to our Learning Management Platform OnlineExpert.com and one of our client dedicated servers. It was the largest software upgrade performed in well over 10 years. Additionally, they supported the GMetrix Project which required allot of testing and implementation support. They also re-negotiated one of our most costly contracts successfully reducing it by over 70%. To top it off they did that with a 40% reduction in staff. These initiatives we all deadline drive and they worked together, as a team to meet every critical deadline. Every step of the way they demonstrated our core values (Ease, Value & Trust) by being Easy it is to work, showing real Trust something we know is earned whether its meeting deadlines, ensuring our networks are operational, or testing that needed to be completed they always delivered on time each and every time. Value– is something they bring to work every day. We could not be more proud of their work and how they go about it. Just like our previous winners, please join me in congratulating them for a job well done as I could not be more proud of this team! 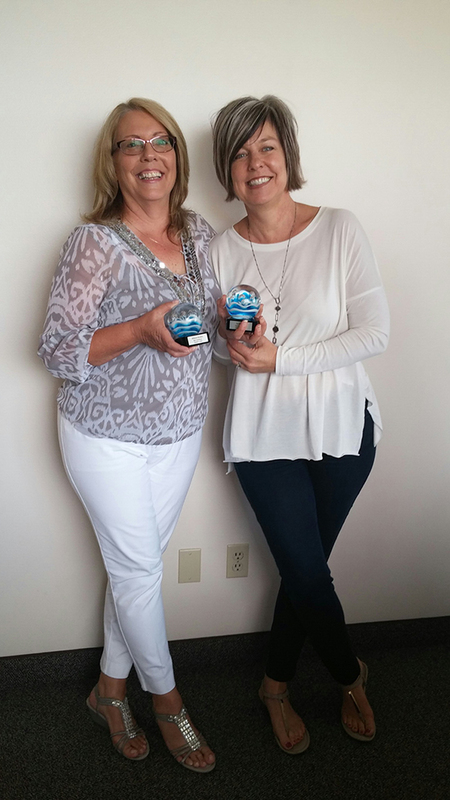 Key Contributor Award Winners – all about Teamwork and Support! Last week Better Learning Systems announced the recipients of our 2016 2nd quarter Key Contributor Awards. One of the key benefits of this announcement is I use it as an opportunity to remind our team members of how important a role our core values, Ease, Value, & Trust, have in this accomplishment. 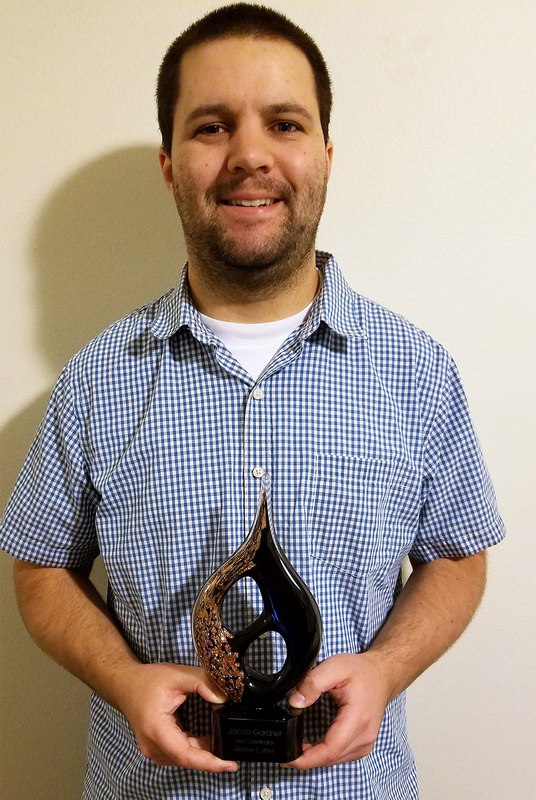 You see this award truly rolls up to making sure those individuals exemplify our core values, and the one thing that stays constant is they can’t do it alone; it takes a team. Our past recipients, Kim Johnson, Wyett Ihler, and Jason Manibog are big team players and truly support any team member they can. Speaking of support we also had a theme this past year and it has been SUPPORT. There is a ton of that going on within our companies – it truly is part of our culture. 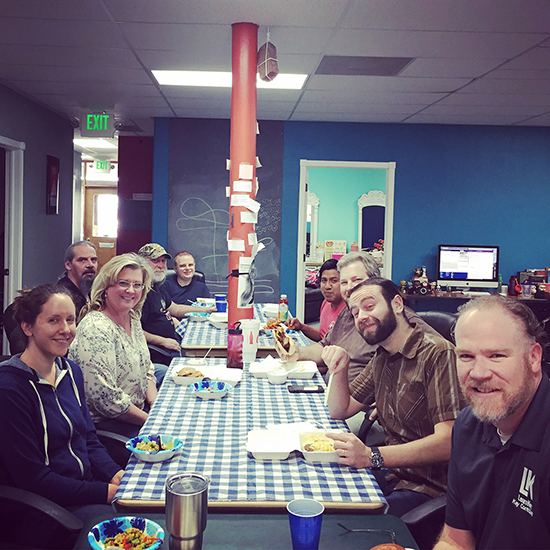 Our production teams, mobile workforce, sales/client services, Veteran Services team, technical support teams, and administrative support working together is what is helping drive our success. One team that really jumped out year-to-date was our Know Your Talents team. The behavioral consulting arm of the company is not only living our core values and supporting one another, they have also increased revenues 200% vs. same period last year. That is why it gives me great pleasure to announce the Better Learning Systems Key Contributor Award winners for the 2nd quarter are Melanie Benitez and Sarah Blik! Sarah has had such a great year with her new sales and growth of existing customers. The largest to date for Sarah has been the Sundt/DPR joint ventures that she has sold. AND she continues to gain referrals across the country due to her success and relationships built with all the Executive Directors of the projects. Sarah has also launched us into the Title and Escrow industry, setting up a paid speaking engagement as general speaker to 200 plus executives. This is now an industry that we are beginning to circulate in which there are not many competitors. Customers always have and do love Sarah. For fun, if you know her ask her why people call her ‘Gnat’! As for Melanie, she has almost 5 times the amount of workshops on her plate, which includes coordinating, printing, and follow up exercises after each and every workshop. She creates a ‘turn-key’ box of all ProScans, workbooks, badges, handouts, and framed certificates for each workshop and her contributions make everyone’s (all facilitators) jobs so much easier. Melanie has developed such tremendous relationships with all clients from a customer service standpoint. As we have had two large national accounts launch this year with ‘unlimited platinums,’ (Creative Testing Solutions, in all Blood Systems facilities, and HealthPlanOne) it requires a ton of coordination from the beginning of implementation and integration throughout the entire company, and Melanie has been in the forefront making this happen. Her Tutor Tuesdays now compete with Tristan’s at LearnKey in that she is gaining more and more attendance each week. Both Sarah & Melanie make it Easy for our customers to work with them, as well as always bring Value to the equation, and we know there is no better way to build relationships unless there is a lot of Trust. That’s our core values at work. Please join me in congratulating both of them for their great accomplishments this past year. 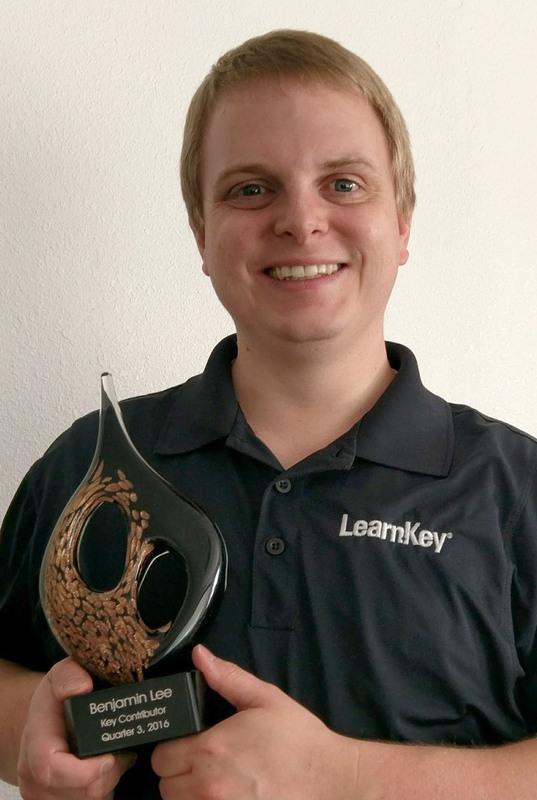 ACTE 2015 has come and gone, and, as always, LearnKey was part of it. Scott Walker and Jared Baker, two of LearnKey’s sales representatives, manned our ACTE booth in New Orleans, and we recently caught up with them to ask them a few questions about LearnKey’s involvement in the show. Why is it important that you attend shows like ACTE? Scott: Several reasons. To see exciting clients. It’s a great place to visit with numerous clients and also a great opportunity for them to meet one another. This particular conference is great for new leads. It’s who we deal with. It’s important for them to see us and learn that we service all areas of the country. Jared: It is the main national show that all of our solutions align to perfectly. What LearnKey product did people ask you about the most? 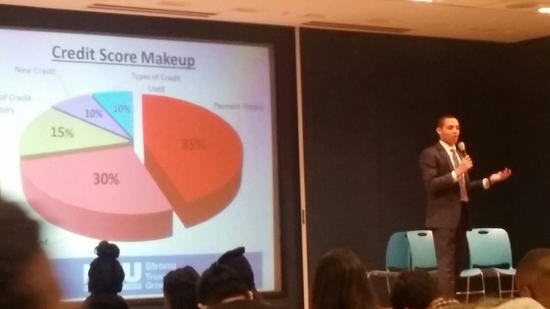 Scott: Microsoft Office, Adobe, and Career Readiness had a lot of interests. What schools or companies stopped by our booth? Scott: School District of Palm Beach; Jefferson Parrish, LA; Iberia Parish, LA; East Baton Rouge Parish, LA; West Baton Rouge Parish, LA; Vermillion Parish, LA; Livingston Parish, LA; Tammany Parish, LA; Erie School District, PA; Philadelphia School District, PA; Alpine School District, UT; Washington School District; Jefferson District, KY.
Jared: NYC Schools, Clark County, Minneapolis, APS, University of New Mexico, Houston, and Dallas. We premiered the new LearnKey Certification Highway at ACTE. Did you have a chance to show anyone? What was their reaction? Scott: I didn’t actually have the opportunity to show anyone. Jared: It was a hit. It was a great way to get people excited about a student’s pathway to a career. Who won the drawing for the watch and headsets? 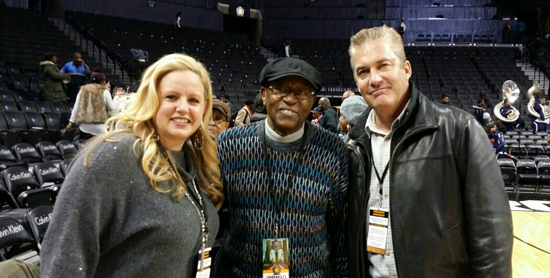 Scott: Chris Broussard from Iberia Parish won the watch, Ronnie Pocorello from East Baton Rouge won a headset. Jared: Alexa Wheeler, University of New Mexico Graphics professor. What is the core message that you try to convey to everyone you talk to at a trade show? Scott: We are the best Curriculum provider, in not only Industry Certifications but Career Readiness and preparation for job readiness. Jared: Every student is not going to college and this gives LearnKey a chance to help each student with a certification pathway to a career. Thanks to all those who stopped by our booth this year, and congratulations to Chris, Ronnie, and Alexa! On May 6, Lori Coruccini, co-founder of Better Learning Systems and LearnKey’s sister company Know Your Talents, Inc., is scheduled to speak at Riding the Wild Haboob, an event for intellectual/developmental disability (I/DD) providers. Lori’s presentation will cover employee engagement and driving company success through the passion and commitment of employees. Other presenters include John Dacey, a health law attorney, and Tom Schramski, PhD, President of Vertess Advisors. 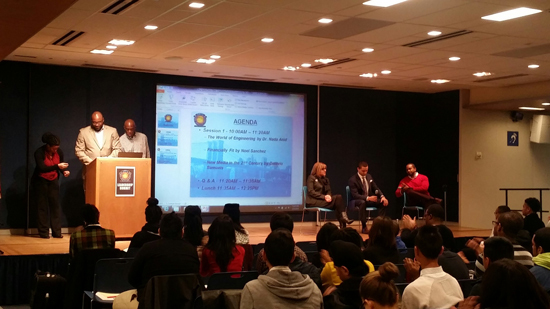 For more information about the event, visit knowyourtalents.com. The Boots to Suits Program through the Pat Tillman Center at ASU is designed to assist veteran students by taking their military skills and education and training and connecting them with the right sources that can help them leverage opportunities for career placement. The goal of the program is to match veteran students with Corporate Executive Leaders within the community that will mentor them towards reaching their goal of that dream job. Students are matched with mentors based on their natural behaviors as well as their intended career path. In February, the initial launching of the program, a mentor/mentee matching event took place. An estimated 30 students were paired with Executive Leaders from all types of industries, with both the mentor and the mentee receiving a copy of their individual ProScan reports. The ProScan was part of the initial introduction – what an awesome way for them to get to know and understand one another!! This post originally appeared as part of the Know Your Talents Spring 2015 Newsletter. Culture Coach? Newest EOM does that too! You always remember when you meet people who are smart and make things appear easy to do. Our newest Better Learning Systems/Know Your Talents employee of the month Melanie Benitez has won over our entire company with that style of work over the past year and a half. That is why when we wanted to introduce a “Culture Coach” she was the perfect person in our company to launch something new like this, and has successfully started by working with our LearnKey Production teams first. 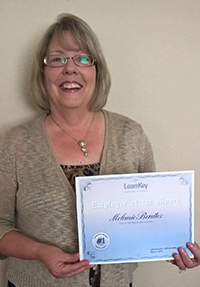 Rolling out something new to employees is a big deal and having someone like her with a positive “can do” attitude is a great quality and strength, which Melanie leverages successfully with her peers. One who doesn’t like to say no (High P!) and gets things done as quickly as “the snap of a finger” has even been compared to that of Barbara Eden from the TV sitcom “I dream of Jeannie!” Melanie just makes things happen. Supporting internal and external customers and consultants with great success is another part of her job, and couple that with the great reputation she has with long-standing trusted partners such as Maricopa Workforce Connections, WIA folks, and MAXIMUS that is a true testament to the type of professionalism she brings our company. 1. How many siblings do you have? I have one older sister and one older brother and then a younger step brother and step sister. 2. What is your favorite movie? Have lots of favorites but I would have to say “Blast from the Past” is my top favorite. 3. What is your favorite band? No favorite really, listen to all kinds of music from Christian to Classic Rock. Like a lot of variety in what I listen to. 4. What is your favorite vacation spot? Napa Valley – could spend an entire summer there just learning about wine and visiting all the amazing eateries there. 6. What is the weirdest combination of foods you have eaten? I don’t know about a combination of foods, but I did try chicken feet once in Chinatown in LA. 7. What is/was the name of your favorite pet? Well I have two, both my pups I have right now. Annie is a Beagle and Hudson is a Brussel Griffon – can’t imagine life without them!! 8. What was your first car? A 1970 Chevy Chevelle – wish I still had that car!! 9. If you could go anywhere in the world where would it be? I would love to see Italy! 10. Would you rather sky dive, bungee jump, zip line, or parasail? Ummm, that would be none of the above. Did get into a hot air balloon one time and that was pretty amazing…this stuff… a bit too “risky” for me. 11. What is the funniest saying you have heard around here? Last week from a client during a PDP Certification workshop “If you have to eat a frog don’t stare at it too long” was a new one to me and quoted from Mark Twain. 12. If you could eat dinner with anyone from the past, present, or future, who would it be and why? I would probably say my grandfather, he was a very firm but kind German man, would be fun to have a behavioral conversation with him! Please join me in congratulating Melanie on her display of all our core values Ease, Value, and Trust, while being a terrific team member and part of the Better Learning Systems family. We are both proud and very fortunate to have her on our team! 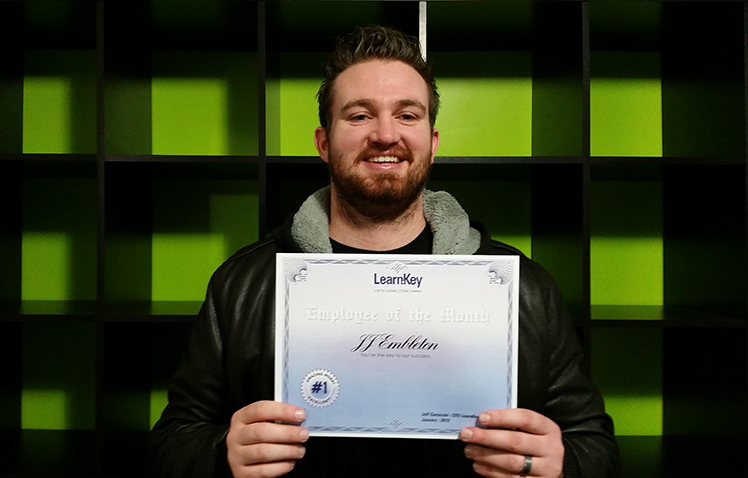 Newest EOM keeps LearnKey looking good! Join me in welcoming in 2015! Its always exciting to start a new year especially when you have a great team. No better way to do that than talking about our great people. 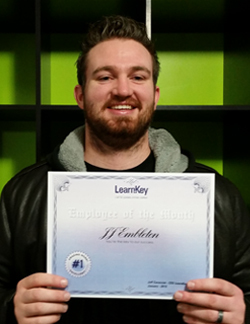 So it gives me great pleasure to announce our first 2015 BLS/LearnKey employee of the month, JJ Embleton, who is our lead on the LearnKey production design team. 1. How many siblings do you have? One Brother and one sister both younger. 2. What is your favorite movie? Haha! It changes about every week for me but right now it is Big Hero 6. 3. What is your favorite band? That is also another one that changes often, but I have been listening to a lot of Archive lately. 4. What is your favorite vacation spot? Anywhere with good vistas and good hikes. I love hiking with my family! 5. What was your high school’s mascot? The Panthers. 6. What is the weirdest combination of foods you have eaten? I don’t know if it is exactly food, but recently when I was super sick and probably doped up on cold medicine, I mixed Grape Airborne with milk… It ended up being pretty good. 7. What is/was the name of your favorite pet? Tango. He was a Yellow Labrador I had pretty much all through growing up. 9. If you could go anywhere in the world where would it be? I would love to go anywhere in the Scandinavian/Icelandic regions. 10. Would you rather sky dive, bungee jump, zip line, or parasail? Sky dive. 12. If you could eat dinner with anyone from the past, present, or future, who would it be and why? My Grandpa Chuck. I knew him well when I was younger but he passed away and I think it would be really fun to get to know him better as an adult. Please join me in congratulating JJ on his recent success and thanking him for his contributions to our great team! In December 2013 Jared Baker and I were invited as guests of Sterling Roberson, Vice President for Career and Technical Education High Schools, with the United Federation of Teachers (UFT) in New York City to attend an event called ‘Big Apple Classic’(BAC). After seeing firsthand what an impact this had on the students who attended last year’s event, we wanted to get more involved in 2014. 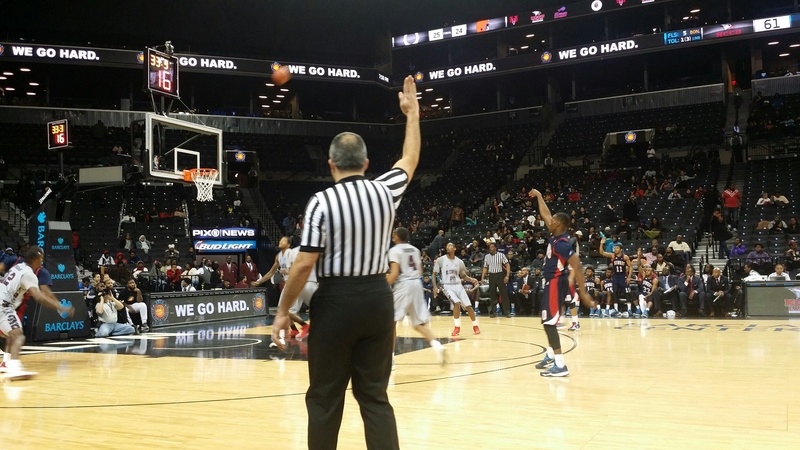 We are excited to announce that LearnKey did play a bigger part in 2014 by sponsoring schools which allowed students the opportunity to attend a basketball game, held in the Barclay’s Center Nets Arena in Brooklyn, and to attend the Leadership Summit, hosted at the UFT headquarters. The Leadership Summit gives students access to accomplished presenters, educators, entrepreneurs, and leaders in the industry inspiring them to set goals, pursue their dreams, and to help them understand that these opportunities are possible for them too. 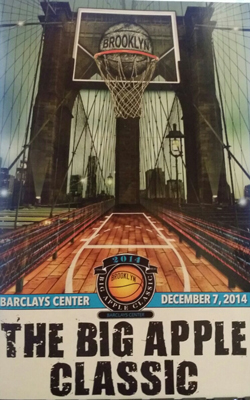 We are extremely excited to be a part of this program by giving back to the students in New York City schools.